Quietly finding her way into places hidden from life ashore. Welcome to Alternative Boat Hire, operating boat trips from the Isle of Iona, a beautiful small island off the west coast of Scotland. 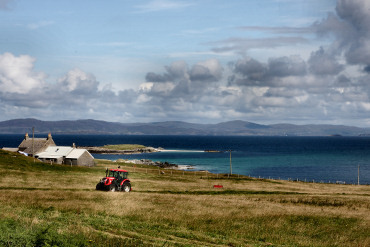 One of the Inner Hebrides, Iona is situated off the southwest tip of its larger neighbour, the Isle of Mull and is famous particularly for its significant role in the history of Scotland as a centre of early Christianity and learning. Iona also happens to be blessed with white sandy beaches, and superb views to the many other islands nearby. Small though it is, the island offers surprisingly varied opportunities and is an easy place to get around. Alternative Boat Hire run boat trips aboard a traditional wooden ex-working sailing fishing boat. 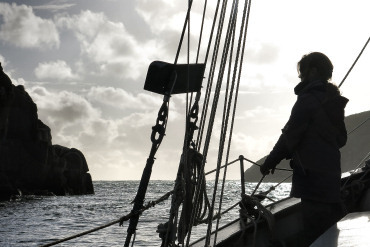 Birthe Marie is an unashamedly old fashioned boat with a gaff ketch rig and a solidity that is reassuring. The whole concept of our trips is of an unhurried drinking in of the landscape. The boat fits into the coastal scene, disturbing little, quietly finding her way into places hidden from life ashore. The wind is what often decides where we will go; trips can be different each day of the week. We take old and young, experienced or complete ‘non sailors’, and can run exclusive small number trips or cater for groups up to 12 passengers. We run a mix of scheduled trips to cater for individuals and families and also operate ‘whole boat hire’ where the skippered vessel is chartered for exclusive use of the party however big or small. Where boats can take you is not restricted to a destination. All photographs are copyright AnjaGrosse-Uhlmann if not stated otherwise.